For the first time in 40 years, the Democrats and Republicans are each on the verge of nominating a candidate who failed to attract even half of their party’s primary vote. Counting fully sanctioned, half sanctioned, and non-binding primaries, Barack Obama took 47 percent of this year’s Democratic vote and was matched virtually ballot for ballot by his tenacious rival, Hillary Clinton. In the process, Obama raised considerable doubt as to whether he can consolidate the portions of the Democratic base – women, working-class whites and Hispanics – that went overwhelmingly for Clinton. But the ability to hold together the party base is a question that also can be asked of the Republicans’ presumptive nominee, John McCain. He too this year drew a modest 47 percent of the GOP primary vote, the lowest share ever for a Republican nominee since the primary-oriented nominating process took root in the 1970s. The Arizona senator showed particular weakness in the GOP heartland – losing much of the South to Mike Huckabee and a large swath of the Rocky Mountain region to Mitt Romney. In their duration, the Democratic and Republican nominating campaigns this year were distinctly different. The Democratic race was a throwback to the 1970s and 1980s, when candidates battled from the beginning to the end of the primary season (and sometimes beyond). The Republican campaign reflected the more recent trend to reach an early decision, with the GOP nomination settled by early March – as was the Democratic race in 2004 and both parties’ nominating contests in 2000. McCain did well enough in the recently completed “mop-up” stage, which the long-running Democratic campaign did not have. He took an aggregate 76 percent of the Republican primary vote in states that balloted after his last major challenger (Huckabee) had quit the race. McCain’s showing was a cut below Ronald Reagan in 1980 and George H.W. Bush in 1988, who each drew 81 percent of the ballots in the mop-up stage of their Republican primary campaigns. Yet McCain’s “end game” showing is in the same ballpark of other recent nominees. George W. Bush took 77 percent of the vote in the Republican primaries held after McCain exited in 2000. At the same time, Al Gore drew just under 80 percent in the primaries held after Bill Bradley departed that year’s Democratic race. And John Kerry polled 73 percent of the Democratic primary ballots in the contests held after John Edwards left the field in 2004. The general acceptance that McCain experienced at the end of the primary season, though, contrasted with the competitive period that preceded it. Then, when the nomination was on the line, most Republican primary voters preferred someone else. In January, when the contours of the Republican race were being set, McCain took barely one-third of the total GOP primary vote (34 percent, compared to Romney’s 31 percent). On Super Tuesday, when he drove Romney from the race with a series of big state, winner-take-all triumphs, McCain was still the choice of only four out of every 10 GOP primary voters. By the end of the voting Feb. 5, with Romney on the verge of withdrawal, McCain had mustered a majority of the Republican primary vote in only three states, all clustered in the Northeast – Connecticut, New Jersey and New York. Even in his home state of Arizona, where he had polled 60 percent against Bush in 2000, McCain’s share of the GOP vote dropped to 47 percent this time. For the first time ever in this primary-dominated era of presidential nominations, the general election will pit two candidates who won less than half their party’s primary vote. Several Democratic nominees have fallen below the 50 percent mark in the past, including Jimmy Carter, who won the White House in 1976. John McCain, however, is the first Republican nominee since then to draw less than a majority of the GOP primary vote. And no Republican has been elected president in the primary era who drew less than 60 percent of the party’s primary ballots. The chart lists all primary outcomes since 1976, the first year that more than half the country held presidential primaries. This year’s presumptive nominees are highlighted in BOLD type. Note: An asterisk (*) indicates an incumbent president. A pound sign (#) denotes that George W. Bush won the all-important electoral vote in 2000 while Al Gore won the popular vote. All primary vote percentages are based on results from jurisdictions that can vote for president in the general election. 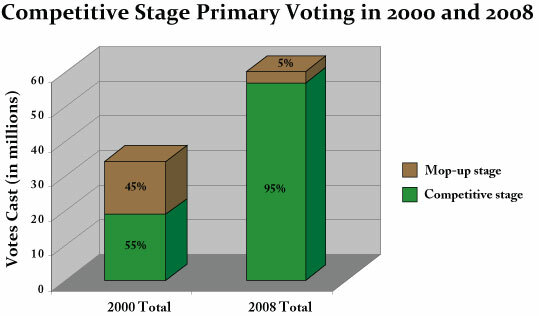 The 2008 percentages are based on a combination of official and nearly complete but unofficial returns. To be sure, many have predicted that McCain would have a harder time in the Republican primaries than the general election, where his maverick image would presumably make him appealing to independents and wavering Democrats. Yet the “intensity gap” that clearly exists between McCain and Obama should be a cause of concern for Republican strategists. The Illinois Democrat has been able to draw huge crowds, a large army of enthusiastic supporters, and has raised bankfuls of money, basically dwarfing McCain in each of these categories. In the primaries alone this year, the Democrats attracted close to 37 million voters, with 17.3 million for Obama. The Republicans, in contrast, drew just under 21 million primary voters, with 9.8 million for McCain. Obama also dominated the Democratic caucuses, a place where passion can be channeled to effect and superior organization is rewarded. McCain, however, fared poorly in the Republican caucuses, losing often to Romney (with his penchant for organization), Huckabee (with his ties to conservative Christians), and in some places, even Ron Paul (with his libertarian, anti-Iraq war candidacy). The hesitancy of evangelical and libertarian Republicans to line up behind McCain was evident in some of the late primaries. Even after he withdrew from the race in early March, Huckabee continued winning double digits percentage wise in a number of states where his name remained on the ballot – including the battleground state of Pennsylvania, plus Indiana, Mississippi, North Carolina and West Virginia, any of which might find themselves in play as the year unfolds. Meanwhile, Ron Paul, who remained an active candidate, peeled off more than 15 percent of the Republican primary vote in late-voting Pennsylvania, as well as a trio of states in the rural GOP heartland – Idaho, Montana and South Dakota. One or more of the latter could find themselves on the Obama “wish list” as the general election campaign develops. The saving grace for McCain – and probably Obama as well – is that the fall campaign is not shaping up like 2004, where both the Democrats and Republicans focused on marshalling their base. The emphasis these days is on outreach and expanding the map. And there, McCain should be in his element just as much as Obama. The 2008 presidential nominating process has been a target of criticism, but one thing it did well was to engage millions and millions of voters in a meaningful way. The Democratic race remained competitive from the beginning to the end of the primary season, meaning that every one of the record 37 million or so Democratic ballots played a role in selecting the nominee. The Republican contest, for all practical purposes, ended in early March, but even there the vast majority of votes were cast during the earlier competitive stage of the GOP contest. That is a sharp contrast with the last open presidential race in 2000, when nearly half of all primary ballots were cast during the mop-up stage after both parties’ nominations had already been settled. Note: The competitive stage includes all primaries held before the last major challenger to the ultimate nominee bowed out. The 2008 presidential primary results are based on a combination of official and nearly complete but unofficial returns from fully sanctioned, half sanctioned (Florida and Michigan) and non-binding primaries. Only jurisdictions that will vote for president in November are included in the tally, meaning that the District of Columbia is included but Puerto Rico is not. Numbers do not always add to the listed total due to rounding.